The old days of noisy, dirty blenders are gone and the new generation of modern, sleek, efficient ones is here! There are a great many blenders to choose from nowadays so we put this site together to give you some help in choosing the best blenders by reading Blender reviews of all the best models. Why This Ninja Blender Is So Good? The Ninja Kitchen System is a multi-purpose Appliance that is a great addition to any modern kitchen. You don’t need lots of appliances if you have this one on your counter-top. Its well priced and makes no compromise when it comes to power. You know exactly what you’re getting when you buy a quality product that’s reasonably priced. The package is complete with all the extras you get and you can blend so many different things as well as grind, chop or even knead bread dough. The appliance boasts 3 blades instead of 2. This makes it a powerful machine that is very quick and ultra efficient. You get great results in a matter of seconds. The machine also has an innovative system that adjusts motor speeds automatically which means it matches the texture and consistency of the ingredients you place in the appliance. These blades are top quality, top of the range that can deal with all sorts of ingredient very effectively from ice cream to pizza dough. The Ninja Kitchen System is a great family-friendly appliance, it handles all you can throw into it quickly and efficiently. There’s a huge 72oz pitcher that’s easy pour. One simple blend and you produce loads of juice or whatever else you need to prepare. Using the appliance could not be easier. Just push the button and off you go. The 1100-watt motor with one-touch pulsing makes it so easy. Just add the ingredients, press the button and the appliance does the rest for you, producing perfect results every time. The design is wonderfully simple, no fancy or needless buttons to confuse you. The best part is that every one of the parts are removable so can be put in the dishwasher to make sure they’re really kept clean. Mixtures tend to be slightly grainy which is something many users have complained about. The Ninja Kitchen System is not recommended as a juicer so if you try it, you’ll be disappointed with the results. Salad dressings and sauces tend to be gritty too. The reason for this is that the design of the blender does not pull the ingredients down to the blade which means your mixtures wont be as smooth as you’d like them to be. The best way to use the blender is to stop half way through and then push the ingredients down before blending them again. The chopping action of the device is not brilliant. The appliance works better as a blender and not a chopper. It has trouble chopping ingredients like onions or garlic. It doesn’t like ice either although a few users have found that their device chops ice really well. You will find that you’ll use this appliance for blending much more than you’ll ever use it for chopping as this is definitely not its niche. The lids of the Ninja Kitchen System are not that easy to put into place either. You need a firm hold to put them on and to take them off which can slow you down when you’re working in the kitchen preparing food. One other thing about the lids which is a bit of a draw back is they are not interchangeable. Also the blades are on the lid and not on the base which means you have to remove the lid so you can take out your mixture. These blades are ultra sharp so you have to make sure your hands are clear of them. If you are thinking about using your appliance for different mixtures, then get ready to wash the lids each time. Is Blender Good Value for Money? Its a great purchase because it is an entire system. It can chop, blend, mix and even knead dough. It is an invaluable kitchen appliance for families who love to entertain because it is very fast and very efficient at what it does. It has a very generously sized pitcher. It is really well priced and affordable. Owning one means you don’t have to invest in lots of other appliances that clutter up your counter-top. Although the chopping action isn’t brilliant, most users think as a blender, it is a really good appliance that’s real value for money. This is a very powerful kitchen appliance that’s capable of blending, chopping, mixing and pureeing lots of ingredients with its Stainless Steel Blades. These power through everything you place in the machine at a whopping 240 mph and with the 2+ horsepower motor, is more than an average user would ever need to use. It has a generous 64oz pitcher so making larger quantities of smoothies, sorbets or soups is not a problem. The appliance produces very good results every time all thanks to the very unique vortex system it uses to drag down ingredients right into the path of the blades. This ensures all mixes end up smooth and silky. The appliance also comes with 2 recipe books and lots of other fun accessories making it one of the best blenders among users. Is The VitaMix CIA Professional Good? This is a very powerful machine that does all it claims to do very quickly. Whether you’re pureeing, grinding, juicing, chopping or anything else, the power behind the machine ensures this is done in record time. There’s a variable speed control knob for ease of use. You can set the appliance to the speed you need by simply flipping the switch to the chosen power setting. Its a very strong and sturdy appliance that’s built to last. It has laser-cut stainless steel blades capable of cutting through anything, including ice and it does this is a matter of seconds. The appliance is made out of metal including the container-to-base drive coupling. The container is a generous 64oz that’s made out of Eastman Tritan copolyester. Everything about the appliance is high quality and this goes for the tight fitting lid as well as the non-slip feet that ensures the appliance remains stable on counter-tops. The vortex system makes sure all ingredients get dragged down into the path of the blades so the results are silky and smooth textures each and every time you blend anything in the appliance. The Eastman Tritan copolyester container is large enough for family use. Its strong and durable and it has a great handle making it very easy to pour ingredients out of the pitcher without creating a mess. The lid fits perfectly and has a removable insert. Cleaning the container is a simple task, all you have to do is soak it in warm soapy water and that’s it. The appliance is a great investment and the nice thing is it comes with lots of accessories that includes recipe books. There’s also an instructional DVD and an owners instruction book. What Are The Downsides of the VitaMix CIA Professional Series Blender? It is a high quality blender which means it is an expensive appliance to purchase. You do get what you pay for which is a very high powered machine that does all it claims to do in seconds. If you’re looking for a blender so you can make a few smoothies, then this machine is far too good for that. If however, you’re looking for a blender you can use every day, then this blender will do the tasks very well, and the investment is well worth it. The instruction manual recommends users go gently on the motor or it may burn out. This means you should not use it for great lengths of time. It is better to set the power on low and then gradually work your way up to full power. If you start off too high, you will hear a grinding sound. If you run the appliance on High or Low for too long, the machine will shut down – for 8 or so hours! Its not an appliance you can just unpack and use straight away. You have to read the instruction manual carefully and watch the DVD. Like this you will understand how complex the machine actually is and what it is capable of doing. If you are looking for an easy to use – push a button and go appliance, this is not the one for you. Is The VitaMix CIA Professional Series Blender Good Value For Money? It is a great purchase for anyone who needs to use a blender on a daily basis. It is in a class of its own, its capable of blending just about anything that’s put in it and it does this very rapidly. The size of the pitcher makes it an ideal choice for families and people who do a lot of entertaining. The VitaMix is a quality kitchen appliance that’s powerful which makes it a blender that’s hard to beat. This Blendtec Total Blender has an amazing amount to offer you as a reliable piece of kitchen equipment. With this one blender you can effectively replace your juicer, smoothie-maker, ice-cream maker, bread maker and iced coffee maker. The blenders high powered 1560-watt motor and two-prong blades of stainless steel are what make it such an excellent choice. It also comes with six blending cycles pre-programmed into the control panel, which makes it fun and friendly to use. Multi-Function: The Blendtec Total Blender does away with having to dig through all your cupboards and pull out multiple appliances every time you want to do some cooking. This blender is dubbed The Professionals Choice for a very good reason. Up to NINE separate appliances can be replaced with this Blendtec Blender! It can do almost anything you could desire: make smoothies, coffees, bread dough you name it! The blender also comes with a guaranteed ice-crushing function, which means you will definitely get proper snow and not just lumps of ice that can result from old-fashioned blenders. Well-Built: The Blendtec Total Blender is designed to be used every day and withstand serious usage. Whereas some other blenders are only intended to be used occasionally, the Blendtec Blender is very sturdy and much more powerful. The 1560-watt motor is of commercial quality and the two-prong stainless steel blades are built to last. The pitcher itself is a square design, rather eye-catching and very practical, with a tight fitting lid that you dont need to fiddle with. This blender will be with you for years to come. Technology: The Blendtec Total Blender comes with some remarkable features of modern technology. The Smart-Touch Technology is made exclusively for Blendtec and is designed to take the guesswork out of blending. You no longer have to stand there with your finger on the button watching the machine like a hawk, or counting off seconds with your watch. Just push the button and walk away! The machine will automatically speed up and slow down so that all the ingredients are brought down onto the blades for even blending. And once the cycle is finished, the blender will automatically switch itself off. Digital Control Panel: With some blenders you get a powerful machine but with few functions; others have plenty of functions but lack power and sophistication. The Blendtec Total Blender brings you the best of both worlds. You get professional-standard speed and power, and a digital control panel which makes operating this blender a snap. The readout will show you exactly what the blender is doing and what stage of the cycle it is at, so you dont need to keep opening the lid to check. The pre-programmed cycles include frozen yogurt, milkshake, soups, sauces, batters, juice, smoothies, ice cream, and many more. There is also a manual pulse function so you can give it a quick blitz. Efficient: This blender is one of the most efficient on the market. The stainless steel blades have a spin speed of 29k RPM, and the 1560-watt motor is as powerful as you could ask. Additionally, with the pre-programmed functions you can literally put the ingredients in, press a button and walk away while the blender does its thing. Ice is normally an area where blenders can fail, but Blendtec have specifically guaranteed this function. Its no wonder that this unit is gaining popularity in homes and restaurants alike. Noisy: As with any powerful blender, noise can be an issue and this blender can really make a racket! If youre blending something hard like ice it can also have a tendency to vibrate itself out of position and potentially off the counter, meaning you either have to keep watching it, or wedge it in between a couple of heavy items. Most people will only find the noise a brief problem since the machine is so quick to blend. However if you live in an apartment or a house with thin walls, blending at unsociable hours will not make you popular! Lid: The Blendtecs jar is square shaped, so of course the lid is too. It snaps on really tightly and as the machine is so powerful and is shooting ingredients right up against the lid, it can be a little stubborn to clean and sometimes requires soaking. This also means than when blending liquids, pulling the top off can lead to the mess from the lid spilling down the sides of the blender. If youre adding multiple ingredients, you can end up with a very messy blender to clean. Is this Blendtec Total Blender a Good Choice for You? With a price tag of nearly $400, the Blendtec TB-631-20 The Professional’s Choice 1560-Watt Total Blender is a high-priced investment, but one that you’ll certainly recoup when you consider that you can replace a number of other appliances with this one unit, which of course will also save on space in your kitchen. Blendtec is a respected brand and this model comes with a three-year warranty. With its powerful motor, efficient blades, and wealth of technological advances, the Blendtec Total blender would make an excellent addition to the kitchen of any serious cook. Thanks to the pre-programmed settings, you really can just put the ingredients in and hit go. The machine will even switch itself off when complete! This blender is a real workhorse and will give you excellent value for money and overall efficiency. If you’re looking for a well balanced blender, the KitchenAid 5-Speed Blender is the one for you. This practical and durable blender has polycarbonate jars and a 0.9HP motor that’s powerful enough to mix, chop, grind and blend all sorts of ingredients. The blender has stainless steel blades and a generous 56oz pitcher that’s easy to clean because its in one convenient piece. 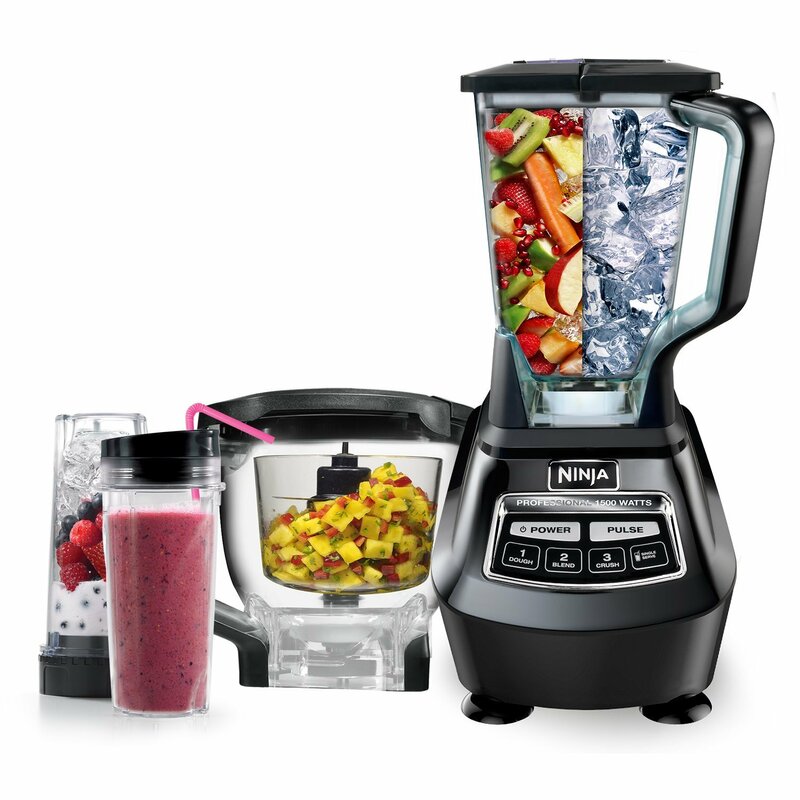 The blender boasts 5 speeds, a die-cast metal base and has a Clean Touch control panel. Its a great accessory to any kitchen that sits well on a counter-top. The great thing about the appliance is it comes in a variety of colors, so matching it to your kitchen décor is easy. The KitchenAid is as good as it gets when it comes to style, efficiency and is definitely one of the top-end blenders around that’s good value for money. Why Is This Kitchenaid Blender So Good? The 5 speed settings allow users to choose what settings they want to work with. Its great to have a high and low setting, being able to choose other settings is fun and this is especially true for crushing ice. This produces perfectly crushed ice with no chunks being left behind. Users can tailor the way they blend their ingredients, they can to this as quietly as they need to. The KitchenAid blender is quiet, it wont disturb anyone around you including your neighbors. The die-cast metal base is sturdy and it comes in a variety of fun colors. This means the blender wont bounce around your work top as vibration is minimal. The blender is strong and sturdy, but its not overpowering in size. With its Clean Touch control panel, its a high tech sophisticated blender thats easy to keep clean and in pristine condition with a quick wipe every time its used. This very practical blender is real value for money. It has 5 speed settings that uses sophisticated technology, Intelli-Speed electronic controls. The blender has a generous 56oz shatter-proof container as well as an automatic crush ice button. Users can program the blender with the digital control panel on the metal die-cast base. It comes in a variety of fun colors so its easy to match in with a kitchen décor as well as a persons character. One great feature is the cord storage which means a nice tidy work surface. Another is the soft-grip handle on the pitcher which makes pouring really easy. The KitchenAid blender is very sturdy and strong. Its a quality blender that features a die-cast metal base and it doesnt vibrate all over work surfaces. The 56oz container is a shatter-proof polycarbonate material that can blend both hot or cold foods. It has robust stainless steel blades, strong enough to cut and crush through ice. This is a one-piece unit that enables easy cleaning as well as durability which means a few years down the line, the blender will look as good as the day it was purchased. The design is really conveniently practical – there are no screws to undo. Cleaning the unit is simple with the added bonus of the blades being dishwasher safe. The blade technology is patented because they are unique, guaranteeing no food getting trapped under the blades. The very generous 56oz container with its large easy to hold handle and drip free spout, are real highlights of the design. The containers thick walls can cope with boiling as well as freezing temperatures, and the wonderful part about the container is that it is extremely lightweight making it easy to work with. So What are the Downsides of the KitchenAid Blender? The pitcher is made out of polycarbonate so if you prefer a glass one, this is not the blender for you. The pitcher is robust but it is still made of plastic. A few consumers who used the blender regularly over a period of time, found the polycarbonate pitcher showed signs of wear and sometimes even developed cracks in it. If you do prefer to use plastic, then this is the blender for you. Remember over time you could always change the plastic container for a glass one if you wanted to. Theres a few issues over polycarbonate pitcher developing leaks. These leaks occur at the seal between the plastic coupling and the shaft of the blades. Many users found these leaks happen early on where moisture has gathered in the base of the pitcher. One way of avoiding this issue is to tighten the nut at the base being very careful not to over tighten it when you do. With this said, the nut will loosen up again every time you use the blender. One good point to remember is the manufacturers have been extremely good about having to replace faulty pitchers on this particular model. So if you have purchased one or have your heart set on buying one, make sure you keep all your paperwork handy for the warranty. Is the Kitchenaid Blender Good Value For Money? The KitchenAid 5-Speed blender does all it claims to do and the bonus is it looks as good as it performs. There’s lots of fun colors to choose from and although the blender is sturdy, it is not overpowering which means it looks good and not too intrusive on your counter-top. It is powerful with its 0.9 HP motor so it can grind, mix, chop and blend a variety of foods very efficiently. The die-cast base makes the blended very stable and the large shatter-proof pitcher is ideal for family use. The tidy away cord feature is a real bonus and so is the drip free spout. All in all this is a really good value for money blender that will fit nicely into anyone’s kitchen.